Invincibility, virtue, insight, honesty, self-determination, spiritual freedom, helps with anxiet, and depression, encourages purification, and control over one's life. Diamond is not only the hardest gemstone, it is in fact the hardest mineral on Earth. That, combined with its brilliant fire and exceptional luster, has made diamond one of the most prized gemstones in the world. Diamond brings longevity (particularly to relationships), balance, clarity, and abundance. It amplifies one’s thoughts, whether they be strengths or weaknesses. It gives one who wears or carries it courage and hope. Diamond is a master healer; it breaks up blockages in both the chakras and the personality. It enhances all the energies in the body, mind, and spirit, thus helping alignment with the Higher Self. Diamond, owing to its natural flashy nature, has long been known as a stone of protection. Having it faceted in a six-sided cut is the best assurance that it will bring the wearer lifelong luck. Diamond has a harmonizing influence on all of the chakras. Placed on the “third eye”, a diamond will help combat mental illness by activating and encouraging the third eye. Diamond strengthens one’s will power and control over the desire body. It breaks up blockages in the crown chakra and gives abundance, trust, faithfulness, innocence, and purity. Diamond is the symbol of the doorway to the heart; it is the diamond of the unseen, and merges dimensions and all our fragments. Each being is a facet within the One Diamond, within the Heart of Pure Love. All Diamonds have a very spiritual vibration and they resonate with the higher chakras, bringing spiritual light into the body from the soul star chakra down through the crown chakra and third eye chakra to the heart chakra. Diamonds are positive stones that assist you in finding the light, and they have a powerful effect to aid the brain. 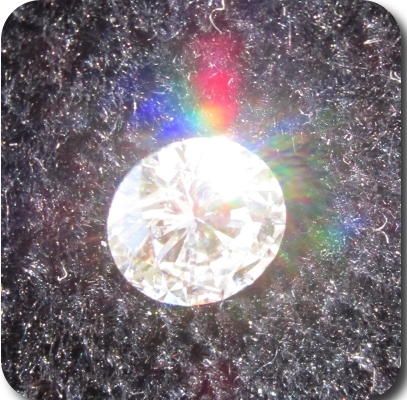 You can even get lower quality diamond stones and their crystal healing properties are highly regarded. They may aid you in developing a number of psychic powers, and in particular the gift of psychic vision or clairvoyance. Diamond represents invincible strength, and enables you to withstand adversity. It dispels anger, strengthens the will, and inspires creativity. Diamond acts as a powerful detoxifier on all levels to the extent that you might have to use other calming stones to modify its action. Diamond enhances the powers of other minerals. A diamond never requires recharging. It is known as the “King of Crystals”.